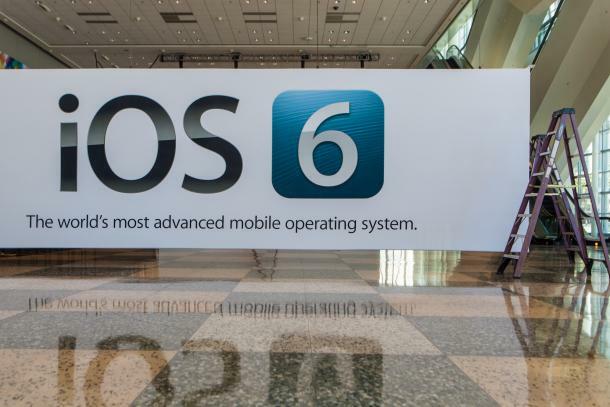 There really wasn’t much of a question, but we have an answer anyway: Apple will, without a doubt, debut iOS 6 at its 2012 Worldwide Developers Conference (WWDC), which begins Monday, and runs through all of next week. How do we know? Well, that picture above, of course! Some camera-toting sleuth from CNet snapped this picture of workers decorating the Moscone Center in San Francisco, where WWDC will take place. Other banners being hung around Moscone tease updates to Game Center for the forthcoming operating system Mac OS X Mountain Lion, and updates to AirPlay, which is used to connect iOS devices to computers and televisions. As for iOS 6, rumor has it that Apple plans to update many of its in-house apps, including a the high-profile debut of its own Maps app, which will allegedly replace Google Maps as the default mapping application on iOS. Further, the Siri voice-controlled virtual assistant will reportedly no longer be exclusive to the iPhone 4S in iOS 6, and head over to the iPad. And Facebook is expected to receive deep integration in iOS 6, just as Twitter did with iOS 5. In terms of hardware, iOS devices will probably sit this one out. But Apple is expected to offer updated versions of most of its Mac line up. A rumor out earlier today indicates that Apple may debut an all new line of laptops, simply called “MacBook,” which will be thinner than MacBook Pro models, but with the same computing power. The new MacBook laptops are also expected to sport high-resolution Retina displays similar to those found on the iPhone 4 and iPhone 4S, and the third-generation iPad. Rumors of at least some new Mac computers receive the Retina upgrade appear all but confirmed give that a number of Mac-only applications have released updates to allow support for the higher resolution Retina displays. The WWDC keynote is set to begin on Monday, June 11, at 10am PT.